NOW Essential Oils Clary Sage Oil is steam-distilled and 100% pure. With an aroma that's herbaceous, wine-like and sweet, Clary Sage oil has been used throughout the ages to soothe nervous tensions, inspire creativity and renew feelings of vigor and wellness. Ingredients: Pure clary sage (Salvia sclarea) oil. 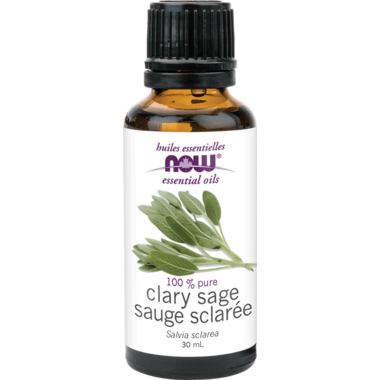 I have been using clary sage for awhile for my skin and monthly cramps. I'm glad NOW is offering on well.CA. I do like this oil in my diffuser. Clary sage seems different from other sage and wasnâ€™t what I expected but it has definitely grown on me. I do like the NOW essential oils. One of my absolute favorites! Great for anything hormonal. Smells nice, and good quality. I bought it mainly to reduce severe monthly cramps, and it works as well as Tylenol, without the nasty side effects! I mix 3 drops into 2ml carrier oil and rub on my abdomen and back as needed. Good quality, nice size bottle for the price and a little bit goes a long way. Love this scent, it's great in my bath! Good price for this size too. Nice scent, good quality brand.